Another Dive Bites the Dust. Actually, Two. There’s no place like Dave’s. Yelp photo by Andy K.
By Dana Eastland. If there were any doubt that the rad dive bar was officially an endangered species in San Francisco these days, news has come that beloved dive bar and SoMa institution ~DAVE’S~ is closing at the end of the year. The bar, which has been on 3rd Street just a block off Market for 26 years, lost their lease and won’t be able to remain. SFist reports that the lease has been taken over by the Future Bars team, of Bourbon & Branch, Rickhouse, Local Edition, and Cask, which is just next door. 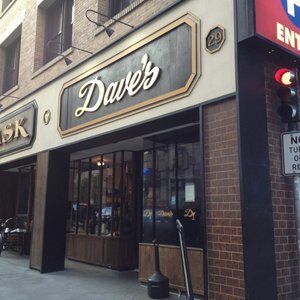 In the meantime, be sure to swing by Dave’s before it’s gone forever. 29 3rd St. at Market, 415-495-6726. If that wasn’t enough to drive you to an early happy hour, Hoodline is reporting that SoMa dive and sports bar ~ZEKE’S~ has also run into landlord trouble and is also closing. According to partner Eileen Chen, the bar lost their lease when a partner passed away unexpectedly abroad, and the lease didn’t get resigned as planned. Now, the bar’s landlord has chosen a new tenant for the space, and Zeke’s will be closing on Saturday October 10th. And let this be a reminder, friends: if you have a favorite bar, a local dive you love, go there often. Spend your money there. Support and enjoy them while you can. We can’t take our city’s gritty heart and authentic soul for granted. 600 3rd St. at Brannan, 415-392-5311. There’s a new bar on Nob Hill for bubbly—and french fries. It’s called ~THE FINE MOUSSE~ and is from Jake Hajer of Woodhouse Fish Co. (it opened in the former Ala Romana). They are serving a selection of reasonably priced sparkling wines by the glass, Eater reports, with the intention of providing a relaxed, neighborhood experience. The french fries are fried in a variety of oils, including a duck fat option, and they are available with several different dipping sauces, inspired by Belgian fries. There are also some small plates like charcuterie and cheese, plus popcorn with porcini mushroom powder. Hours are Tue-Sun 12pm-12am. 1098 Jackson St. at Taylor, 415-908-1988. Billecart-Salmon, all ready for you at Ferry Plaza Wine Merchants. Photo from Facebook. It’s time for some bubbly at the ~FERRY PLAZA WINE MERCHANT~. 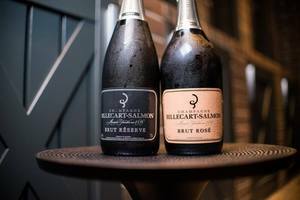 On Wednesday October 7th from 4:30pm to 7:30pm, they will be hosting a special night of bubbles from Billecart-Salmon, including the Billecart-Salmon Brut Sous Bois and the 1999 Billecart-Salmon Cuvée Nicolas François Grand Cru, which will both be available by the glass (that never happens!). You can also try a flight of four Billecart-Salmon Champagnes for $48, and all bottles poured will be available at a 15 percent discount to anyone who purchases a flight. One Ferry Plaza, Shop 23, at Embarcadero, 415-391-9400. Fans of sour beer will want to pay attention to this one. On Saturday October 10th, catch the Sour/Bitter Fest going on in the lot behind ~THE TRAPPIST~ from 2pm to 5pm. Ten breweries will be in attendance with kegs of their sour and bitter beers, and six restaurants will be serving paired bites. Breweries include Sante Adairius, Rare Barrel, Almanac, and Allagash, while restaurant participants include Ramen Shop, Tamarindo, and Homestead. Tickets start at $42 for general admission, which includes unlimited tastes of beer. Food bites are $2 each at the event, or you can purchase tickets with included bites; details and tickets here. 460 8th St. at Broadway, Oakland, 510-238-8900. Local barman Duggan McDonnell is going to be at ~DOC’S LAB~ on Tuesday October 13th for Books and Booze. He’ll be talking about his new book Drinking the Devil’s Acre in conversation with Jordan Mackay, plus there will be live music from Duo InAuthentico. The event starts at 8pm (doors at 7pm) and tickets begin at $15 per person, which includes two drinks at the bar, or $40 for VIP tickets, which include a copy of the book—you definitely want it on your bookshelf. 124 Columbus Ave. at Pacific, 415-649-6191. ~HILLSIDE SUPPER CLUB~ is hosting another producer’s dinner with Fort Point Beer founders Justin and Tyler Catalana plus head brewer Mike Schnebeck on Wednesday October 14th at 7:30pm. The dinner will pair four courses of dinner with beer from Fort Point, including confit pork shoulder with black barley, sunchoke purée, and fall squash. With each pairing, chefs Tony Ferrari and Jonathan Sutton will talk about the food and beer pairings along with the special guests from Fort Point. Tickets are $100 per person including food and beer, but not tax and tip. 300 Precita Ave. at Folsom, 415-285-6005.